Precious metals ended slightly lower Tuesday. Palladium’s loss was its first in eleven sessions and the first in eight sessions to miss ending at a record settlement. Declines in gold and silver were their first in three sessions. Gold for February delivery fell $2.90, or 0.2%, to settle at $1,288.40 an ounce on the Comex division of the New York Mercantile Exchange. "Technically, February gold futures bulls still have the overall near-term technical advantage. A two-month-old price uptrend is still in place on the daily bar chart. The recent sideways pause is not bearish," Jim Wyckoff, a senior analyst at Kitco Metals Inc., said in a report. "Gold bulls’ next upside near-term price breakout objective is to produce a close above solid technical resistance at $1,300.00. Bears’ next near-term downside price breakout objective is pushing prices below solid technical support at $1,260.00." 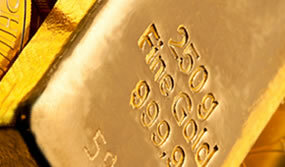 Gold futures ranged from a low of $1,286.50 to a high of $1,294.80. They rose 0.1% on Monday. Meanwhile, silver for March delivery fell 6.6 cents, or 0.4%, to close at $15.62 an ounce. Silver futures traded between $15.57 and $15.74. They climbed 0.2% on Monday. April platinum lost $2.40, or 0.3%, to $800.10 an ounce, ranging from $798.10 to $809.70. Palladium for March delivery shed $4.90, or 0.4%, to $1,277.10 an ounce, trading between $1,274.10 and $1,296.80. On Monday, palladium ended at $1,282 an ounce for its seventh straight record settlement. Gold added $1.65, or 0.1%, to $1,294.40 an ounce. Silver declined 1.5 cents, or 0.1%, to $15.60 an ounce. United States Mint bullion sales registered their first gains of the week. Advances included a combined 2,000 ounces in American Eagle and Buffalo bullion coins and by 100,000 ounces in American Silver Eagles.